Taped Oct. 21, 2006, at Congregation Beth Shalom in Santa Clarita, Calif. This week’s Newsmaker is actor Leonard Nimoy, author of “Shekhina,” a photographic exploration of the feminine aspect of God. The interview was taped on location in Santa Clarita at Congregation Beth Shalom, where Nimoy gave a presentation about his work. Questions are paraphrased; answers are presented in full. SCVTV: Thank you for joining us here at Congregation Beth Shalom. Nimoy: Hello. Thank you. Pleasure to be here. Nimoy: Well, the book has been out for a while, actually. It’s a photographic study on the subject of the feminine aspect of God. Several years ago, a rabbi educated me to the idea that Jewish mythology tells us that God created a feminine aspect of himself — split off a feminine aspect of himself to live amongst humans — and the idea intrigued me. I’ve been involved with photography for many, many years, ever since I was a teenager, and I’ve been working on images of the female figure. I became intrigued with the idea of exploring the possibility of finding, the ways of expressing this in photographic imagery, the idea of this feminine deity — a deity that supposedly exudes a lot of light, compassion, sensitivity, intercedes between humans and God when necessary — and that’s essentially what motivated the book. SCVTV: The lady who appears in many of the photos in the book is wearing nothing more than some of the religious vestments that are typically worn by men. How did you come to express her, and the idea of her, that way? Nimoy: You know, it may be surprising to some people — but not necessarily everybody — that the religion, and the literature of the religion, carries an awful lot of sensuality in it. There are numerous stories that have to do with the sexuality and sensuality of the historical figures. I decided to not shy away from it, and not portray this figure as some misty figure in clouds somewhere. I decided to make her a flesh-and-blood being who could appear or disappear if she chose to. But if she appeared, would be physical, would be an actual, physical, feminine figure. It has created some degree of intense conversation in some communities, some quarters. But by and large, the reception has been very positive. A lot of people are intrigued, want to know what this is all about. If they have some Jewish background, and maybe have some sense of the history of the idea but have never been confronted with this physical reality that I’ve given her — and you’re right. The prayer shawl that she wears, and the phylacteries that she wears around her arm, are typically worn by Jewish males. So there’s a certain kind of transgression going on. SCVTV: In your mind, is this woman what the allegorical figure looks like? SCVTV: And yours is available where? 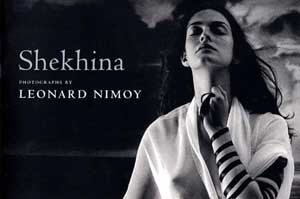 Nimoy: She’s in the book. SCVTV: No — where do people get hold of the book? Nimoy: Probably in some bookstores or some art bookstores, but it’s available on Amazon.com. SCVTV: OK, you said there has been some interesting reaction to it. You’ve come here to Congregation Beth Shalom, which is a conservative congregation; I guess we’ll find out when you make your formal presentation in a few moments, but how do you think Rabbi Steve Conn’s congregation will receive it? Nimoy: You know, I’m curious. I don’t know the answer to that question. I’ll let you know in a couple hours. I’ve had a very wide range of responses, everything from a welcoming and excited response in a positive kind of way, to a total censorship rejection. In a couple cases, a couple congregations where I was initially invited to come and speak, when they saw the book and saw the images, they said, “No. Don’t come. Don’t bring those pictures, either.” So I wouldn’t be surprised by whatever the reception is. Most important is that the ideas that this book engenders, and the conversation that it engenders, is exciting and interesting and stimulating, and I think it’s stimulating to a lot of other people, as well. SCVTV: What kind of emotional reaction do you want people to come away with when they look at the photographs? Nimoy: I want people to be enlightened in some way, to learn something that perhaps they didn’t know before. I want them to be moved in some way that perhaps might surprise them. The subject matter moved me when I began to explore it. I say in the book that making these images was a very spiritual and interesting experience for me, that it brought me closer to spirituality, that it surprised me. I’d like people to think that it’s a worthwhile piece of work. It is also, by the way — it is a work of art and therefore should be stimulating in some way. If it’s not stimulating, it’s simply decorative and pretty. Some people think they’re pretty, and I’d probably agree with most of that, but they’re not intended to be just simply decoration. They’re intended to be thought-provoking. SCVTV: How long have you been interested in this spirituality or mysticism? Nimoy: Well, the origins of the idea for the book came to me about eight or nine years ago in a conversation with my family rabbi in Los Angeles. He was the first one who introduced me to the idea of the Shekhina, the feminine aspect of God, and that there is a point in the Jewish service where mythology tells us that that Shekhina comes into the sanctuary to bless the congregation. I remember as a kid, maybe 8 or 9 years old, at an Orthodox service, at a certain point in the service, my father said to me, “Don’t look,” and everybody’s got their eyes covered and they’ve got their prayer shawls over their head — and I never understood why. This rabbi explained that the mythology tells us that that’s the moment when the Shekhina comes into the sanctuary, and the congregation protects themselves from this awesome light that might hurt you, by covering your eyes or closing your eyes. That’s why you don’t look. So when I heard that, when he told me that, I began to wonder what it might be like to try to visualize this, to try to capture it with a camera. SCVTV: Where were you 8 or 9 years old? SCVTV: Were your parents religious people? Nimoy: They were observant. We lived three generations in an apartment with my grandparents, my parents, and my brother I, and I would say the observant people were my grandparents. We lived in a kosher environment; my parents kept separate dishes and separate cutlery for the meat and for the dairy and so forth, but we weren’t a family that what I would call “devout” who went very often, every week or whatever, to a synagogue, but (rather) on the holidays and so forth. SCVTV: How does an 8- or 9-year old kid who’s inspired and interested in this aspect of Jewish spirituality end up coming to Hollywood at age 20 or so? Isn’t Hollywood full of heathens and sinners? Nimoy: (Laughing) Well, around the same time that I became interested in photography, I was very lucky. I lived in a neighborhood that was very cultural. Boston was, still is, a very kind of thriving city in terms of culture: a lot of theater, a lot of dance, a lot of music, and the neighborhood that I lived in had a wonderful little theater in what was known as a settlement house, a place where kids could go after school, and you could be involved in a science program or an athletics program, and there was a theater program. One day, somebody said to me, “Go in and see those people in that room down there,” and I walked in, and I was 8 years old — I walked in and they said, “Sing us ŒGod Bless America’ or something,” and I did. The next thing I knew, I was Hansel in a production of “Hansel and Gretel.” And that’s how the whole thing started. So I continued acting there until I was in my late teens, and then I decided that it was what I wanted to do with my life. SCVTV: So you came out to Hollywood, and at some point you were under contract with Republic? Nimoy: No, not exactly. I did some work at Republic; it wasn’t a contract. I was a freelance actor for a number of years, so I worked at Republic, I worked at Universal, I worked at MGM, I worked at all those studios. But I did do some work at Republic. In the very early years, I did Westerns for them, and science fiction shows for them, early 1950s. SCVTV: Saw you on the Encore Westerns Channel the other night — Leonard Nimoy in a cowboy hat. Nimoy: At Republic, they used me as an Indian. I played Indians in Republic movies. There was a series of films with an actor named Rex Allen, and his buddy in those movies was an actor named Slim Pickens, and they needed somebody like me to play the bad guy. That was me. I rode horses and wore a wig. That’s what I remember about it. SCVTV: What’s your earliest memory of the Newhall-Saugus area, as we used to call it? Nimoy: I remember working at Vasquez Rocks a number of times. The last time that I was involved in something at Vasquez Rocks was some footage that we shot for “Star Trek IV,” a movie I directed. If I remember correctly, there’s a shot of me as Spock on top of one of the rocky areas, and maybe some other footage, but I don’t recall at the moment. But Vasquez Rocks was very useful because it did have that desolate kind of uncivilized look. SCVTV: Had you used it in Westerns? Nimoy: Have I used it in Westerns? I never directed any Westerns. SCVTV: No — have you appeared in any Westerns in which it was used, back in the ’50s and ’60s? Nimoy: I was in all the Western TV shows. I was in “Wagon Train” and “Rawhide” and, oh golly, you name it, I was there. I can’t remember all the names, but I must have appeared in maybe 15 or 20 different Western TV shows. SCVTV: Your credits seem to go back and forth between Westerns and science fiction. Nimoy: Science fiction, Westerns, yeah. In the Westerns, I usually played bad guys and sometimes Indians and sometimes other characters; often people who were in trouble of some kind. SCVTV: Obviously you went in the science fiction direction to a great extent and kind of left the Westerns behind. Nimoy: Well, the Westerns kind of faded away when science fiction became popular. In “Star Trek,” for example, instead of the Indians being the bad guys, it became the Klingons. I mean, that’s a fact. The westerns kind of disappeared when science fiction became the frontier, as opposed to the West. The Westerns kind of gradually faded away. Nimoy: Yeah, exactly. I worked with Clint Eastwood on “Rawhide” many, many years ago. I did all those shows. SCVTV: Throughout the early years in your film career, did religion or spirituality have any impact on you? Nimoy: No, no. Not that I recall, no. Much, much later — maybe, oh golly, maybe 20 years ago, I produced and acted in a two-hour television movie called “Never Forget,” which was based on a true story, based on a man who lives in Southern California who was taken into Auschwitz with his family during the Second World War and lost his parents and his siblings — came out alone, and he was only about 17 or 18 when he came out, alive. He eventually got into a battle with an organization of Holocaust deniers, people who were professionally distributing literature that said the Holocaust was a hoax. He got into a legal battle with them and finally won a case against them in Los Angeles Superior Court in 1979. So about 20 years ago I did a TV movie about him. That’s the closest I think I’ve come to dealing with any of the religious or secular Jewish issues. SCVTV: Since we’re on the subject of religion, tell us how you came up with Spock’s hand gesture. Nimoy: OK. We’ve sort of been dancing around that issue in this conversation, and now you want to get to the nitty-gritty. Nimoy: OK. During the service that I mentioned earlier, when supposedly Shekhina comes into the sanctuary to bless the congregation, there’s a prayer where the members of the priestly tribe of the Hebrew bless the congregation with a prayer that we know in the English and in the Hebrew, the Old Testament and the New Testament, as “May the Lord bless you and keep you, may the Lord cause his countenance to shine upon you and grant you peace,” and so forth. Well, in the service that my family attended when I was a kid, these gentlemen who did that prayer, who blessed the congregation with that prayer, used that gesture: They extended their hands like that over the congregation. I had no idea what it was, but it intrigued me, and it was in that moment that my dad said, “Don’t look,” and everybody’s got their eyes covered and they’re all looking away. Well, I peeked! I was an 8-year-old kid who was curious, and I peeked and I saw that. So I started working on it. I thought, I wanted to master that, to be able to do that. I just put it away in my head someplace. As I said, I didn’t know why they were doing that, but I learned later that this is the shape of the Hebrew letter, a letter in the Hebrew alphabet called “Shin.” And the “Shin” is the first letter in the word “Shaddai,” which is the name for the Almighty, and it’s also the first letter in the word “Shekhina,” which is the name of the feminine aspect of the Almighty. So the idea is that they’re using a symbol of God’s name when they bless the congregation with that. SCVTV: Does the hand have some particular importance? Nimoy: No, I don’t think so. But I was intrigued with the idea that it was an interesting formal greeting, that it was used as a formal greeting. SCVTV: That actually wasn’t where I was going with that question. When I asked if spirituality had an impact on your film career, it’s this: If you look at “Star Trek III” and “Star Trek IV,” which you directed, particularly with “Star Trek III,” it seems there is very much a spiritual aspect to the character you play. SCVTV: So was that intentional? I’m trying to get a picture of how these things tie together. Nimoy: Not necessarily religious, but spiritual, yes. “Spirituality” is a word that we hear a lot, and I use it freely, maybe too freely. What does it really mean? To me, it means morality, it means ethics, it means living ethically, living a decent life, treating people decently, caring about what happens to somebody besides yourself, being aware that you’re not alone on this planet, and not everything is about you; that there are reasons to take other people into consideration, and other things, other issues, to take into consideration besides your own daily responsibilities and your own career and your own needs and desires. It just means living a full life as a considerate human being. That’s what I consider being a spiritual person. It doesn’t necessarily mean — I know people who don’t believe in God, but I consider them spiritual people. So I think that spirituality is something that’s not necessarily religious. It can be, of course, but not necessarily religious. SCVTV: Do you go to synagogue regularly? Nimoy: No, not regularly. We go on the week of the High Holidays, and our rabbi happens to be my wife’s cousin. We think a lot of him. He runs a very good congregation. One of the reasons we think a lot of him, think highly of him, is because his bent, his orientation, is toward the community. It’s not about, are you a good Jew, or are you a bad person, or are you evil or obscene or any of that kind of thing. It’s about being a useful part of the community. It’s about helping in the community and making a positive impact in the community. And we believe in that. SCVTV: One last question has particularly to do with our valley. I understand that in an episode of the original “Star Trek” called “The Arena,” where Captain Kirk is at Vasquez Rocks battling this green lizard called the Gorn — which was played by Bobby Clark, who lives here in the Santa Clarita Valley — I understand you got too close to an explosion that went off. Nimoy: Bill (Shatner) and I did have an experience — it might have been on “The Arena,” I don’t remember which episode — but it was not an exterior moment. We were on a sound stage when it happened. There was an explosion that went off, off-camera, and typically, when there’s a planned explosion in a scene in a movie, they will open the sound stage doors so the concussion has some place to go; it can go outside the doors. Well, they had failed to open the doors, so there was a big concussion within the building, and we were close to it, Bill and I. Since then, Bill and I both have a ringing in our ears, which is called tinnitus. We believe it was caused by that particular experience. It might have been on that episode, but it wasn’t out at Vasquez Rocks. It was inside a sound stage. SCVTV: Good. Didn’t want to think that we here in the Santa Clarita Valley had that impact on you. Nimoy: You’re not responsible. No, you’re not responsible. Off the hook. SCVTV: What’s your connection to Congregation Beth Shalom? Nimoy: Adam Malin, who is a member of this congregation, is a good friend of mine. We’ve been working together, golly, for maybe 30 years. He is a convention producer, and he has produced an enormous number of very successful Star Trek conventions that I’ve appeared in, and so has Bill Shatner and all the other “Star Trek” people. So he asked me if I would come out and do this, and I’m here for that reason. SCVTV: I guess we’ll find out what their reception is to your book. Nimoy: If I get in trouble, help me out, will you?